Everything you need to know about Marico and our businesses. When was Marico formed and who is the Promoter? Marico was incorporated in the year 1988 and listed on the NSE and BSE in the year 1996. The Chairman of the Board is Mr. Harsh Mariwala and majority of the shareholding is held by the Mariwala family. Please refer to the latest Shareholding Pattern posted on the website for further details. Marico is a professionally managed organization. Please refer to the profile of the Leadership Team and the Board of Directors. Marico operates in the Beauty and Wellness segment in the Hair Care, Skin care, Healthcare and Male Grooming categories across India and outside India. More than 90% of the Group's turnover comes from categories in which Marico enjoys the No.1 or No.2 position. To know further details about Marico's business, please refer to the Corporate Presentation. 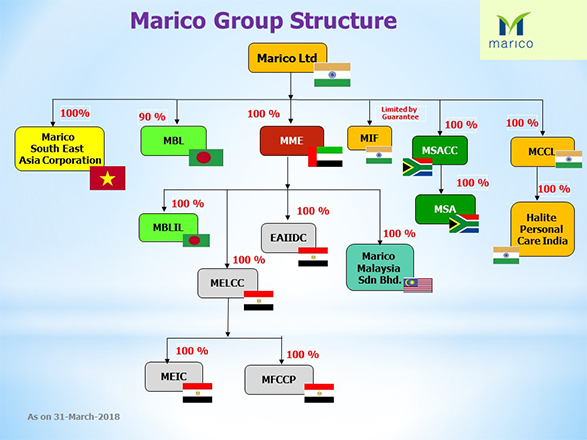 What is the Marico Group Structure? And in which countries does Marico have subsidiaries ? Where can I get a copy of Marico's Annual Report? To access the Annual Report, Click Here. How is Marico contributing towards sustainability? Marico's value system in 3 simple words is "MAKE A DIFFERENCE". Please find details on Marico Sustainability initiatives, including the Annual Sustainability Reports here. How do I track the latest prices of key input materials and the changes in MRP of products? Market prices of key inputs and MRP of the products are updated on the company's website on a monthly basis. Please find the latest update here. What is the product reach of Marico? Marico today touches the lives of 1 out of every 3 Indians. Marico sells over 15.5 crore packs every month through about 4.9 million retail outlets services by its nationwide distribution network comprising 4 Regional Offices, 26 carrying & forwarding agents (CFAs) and about 5,600 distributors and stockists. Marico's distribution network covers almost every Indian town with the population over 5,000. Where are factories and sales offices located in India? Click here to find the list of factories and sales offices. Where can I find out Marico's current share price? You can find Marico's current share price on the stock exchange websites on a real-time basis. Please find the links here: BSE and NSE. How do I contact Marico's Investor Relations team? The company has a dedicated Investor Relations team and can be contacted at investor@marico.com.